Please ask your server about the soup of the day. A traditional Mi'kmaq quick bread, served with a spinach artichoke and cream cheese dip. With lime tzatziki and grilled pita wedges. Pan seared jumbo sea scallop on a bed of creamy mushroom and spinach risotto finished with chives and Asiago cheese. Warm curried chick peas, roast garlic hummus, grilled Naan rounds. Vegetarian. 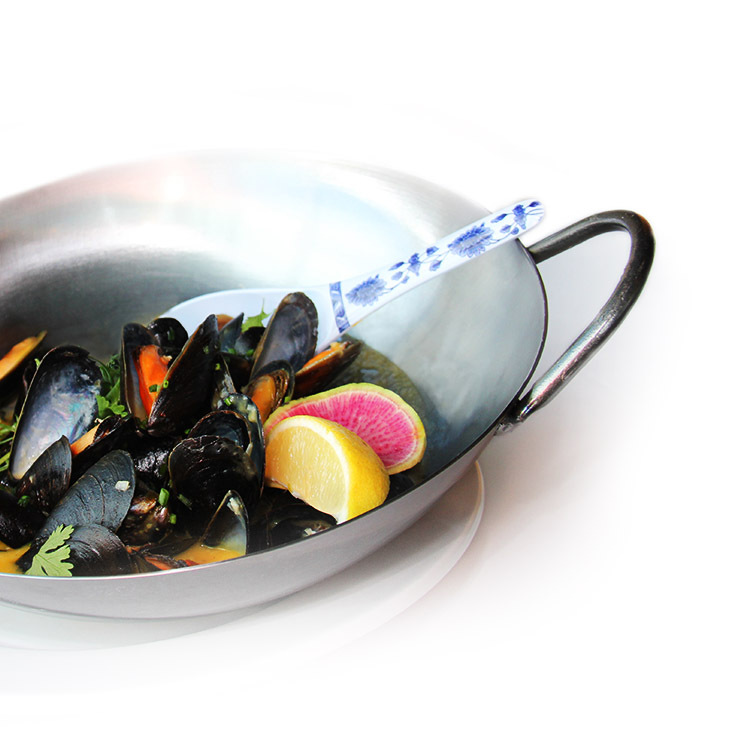 Cultivated cold water mussels, lemon grass puree, chillies, garlic, cilantro, toasted sesame. Gluten Free. Fried Cajun crusted haddock loins, bulgoogi sauce, shaved red onion, served in buttercup lettuce leaves. Gluten Free. A creamy fennel tarragon veloute with vegetables, herbs and market inspired fish and shellfish. Crispy chicken wings with carrot and celery sticks. Add chicken to any salad for 4.00 extra. Artisan greens with shaved carrot, cucumber, Bermuda onion, bell peppers and tomatoes with our signature strawberry maple balsamic dressing. Gluten Free, Vegan. Crisp romaine tossed with bacon, Asiago and croutons finished with our creamy house dressing. Grilled striploin and artisan greens with charred peppers and grape tomatoes finished with our raspberry lime vinaigrette and a few flurries of goat cheese snow. Gluten Free. With beluga lentils, arugula, sundried cranberries, apricots and a mango honey dressing. Gluten Free, Vegetarian. A mix of baby greens, kale and spinach grilled chicken breast, avocado, bacon, boiled egg, shredded Gruyere cheese and buttermilk dressing. Gluten Free. Our Version of the Classic Clubhouse. Grilled marinated chicken breast, heirloom tomato, parmesan aioli, double smoked bacon, crisp baby greens, and avocado served on porridge bread. Tender turkey breast on hearty bread covered with house gravy. Shaved beef with sautéed peppers and onions served on a hoagie bun with a three cheese blend. A grilled striploin steak served on a thick cut of garlic bread topped with mushrooms, onions and peppers. 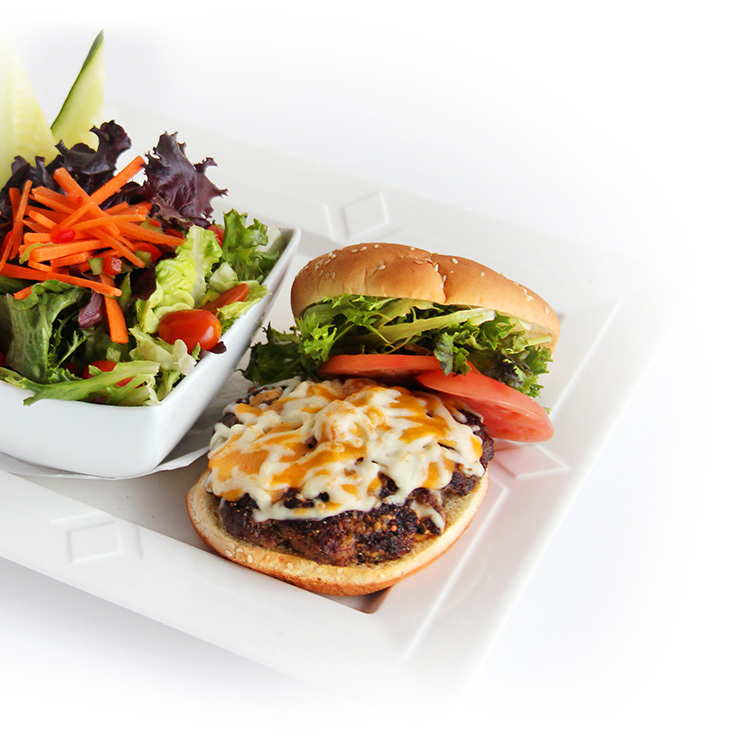 An 8oz handmade charbroiled burger on a toasted sesame bun with a three cheese blend, artisan greens, and Roma tomato. A charbroiled 8oz Angus beef burger topped with grilled pineapple, double smoked bacon, mango relish and white cheddar. Tender pieces of Angus beef, Shiitake mushrooms, carrots, turnip, baby potatoes, parsnip, celery and roasted onions in a rich rosemary jus topped with flakey pastry. Pan fried liver with onions and crisp bacon. Served with pan gravy, vegetables and choice of baked potato, fries, or mashed potatoes. Roast lamb meatballs with Pappardelle pasta, sautéed market mushrooms, rosemary, Asiago cheese and tomato sauce with thick cut garlic bread. Tender lasagna noodles layered with meat sauce, cottage cheese and mozzarella with thick cut garlic bread. Salt cod, potato, bacon and onion fried to a golden brown and served with a crock of our house made beans and topped with our house mustard pickles. 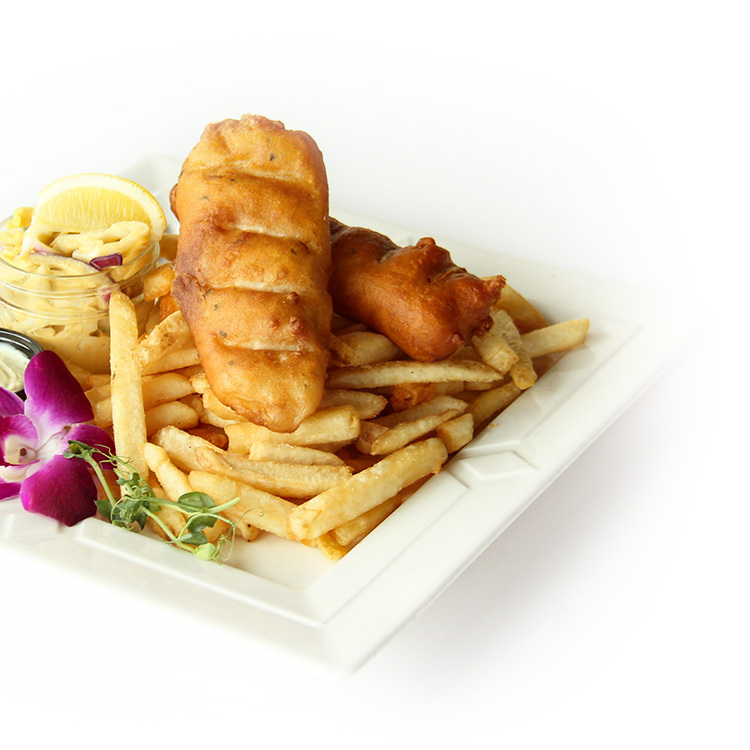 Big Spruce battered haddock loins fried golden brown and served with crisp fries and our creamy lemon tartar sauce. Savoury meatloaf braised in a mushroom gravy. Served with vegetables and choice of baked potato, fries or mashed potatoes. Linguine pasta and grilled chicken breast in a classic Alfredo sauce with grilled garlic bread. upgrade to a spinach salad for 3.00 extra. Excludes items marked with “No substitutions”. Butternut squash ravioli in a lemon basil reduction toasted pine nuts, thick cut garlic bread. Vegetarian. No substitutions. Slow braised lamb shoulder and fennel in a Cereal Killer oatmeal stout jus with root vegetables and baby dubs topped with flakey puff pastry. Maple sweet grass laquered Atlantic salmon, raspberry spring onion salad, wild rice popcorn. Gluten Free, Mi’kmaq Inspired. Chicken braised in a fragrant tomato cardamom curry reduction, Jasmine vegetable pilaf, curried chickpea and lentils, grilled naan bread and papadum. No substitutions. Sweet South Shore lobster, brown butter leek risotto, shaved Gruyere cheese, ground pink peppercorns, micro basil. Charbroiled Certified Angus Beef ® striploin with porcini mushroom jus and tobacco onions. Pan seared pork tenderloin stuffed with apricots, ricotta, pecans, spinach, and toasted fennel with a Lunenburg country winery pear wine reduction. Gluten Free. No substitutions. Gluten free spinach linguine, tofu, heirloom tomatoes, locally grown sprouts, avocados micro basil and market mushrooms. Vegan. No substitutions. Martock Glen Farms pheasant breast, Gala apple rosemary and luski stuffing, roasted grapes, jus. Pan seared potato crusted Nova Scotia haddock fillet with warm fennel chow chow. Sweet and spicy ribs, warm kimchi potato salad, corn scallion fritters. No substitutions. Bacon wrapped 5 peppercorn beef tenderloin, tea mushroom jus, lobster cake herbed aioli. A graham crust topped with coconut milk pudding and finished with whipped cream, toasted coconut and a drizzle of crème anglais. Market inspired, creamy baked custard, caramelized sugar crust, garnished with mint and fresh berries. 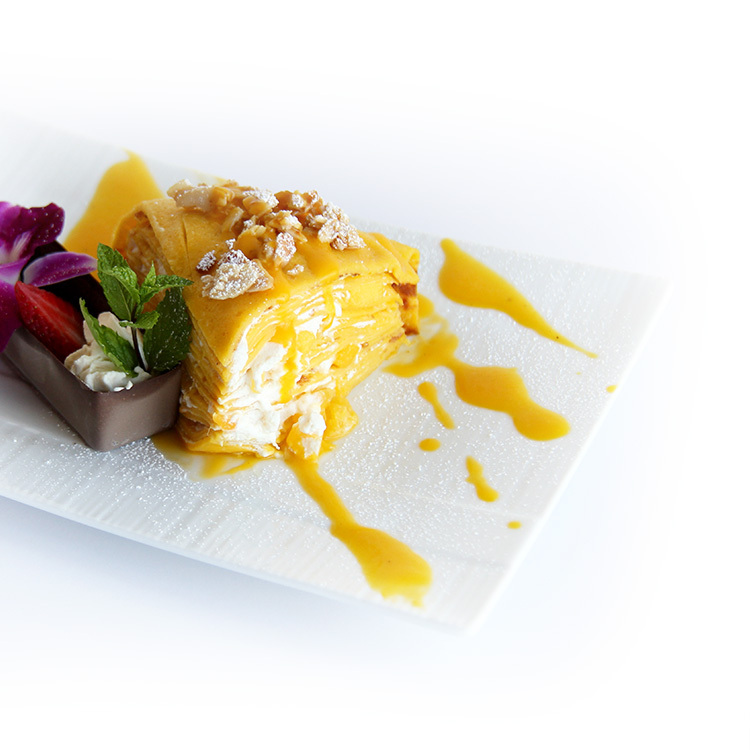 Light cheesecake wrapped in phyllo served warm with seasonal berry compote and French vanilla ice cream. Milk chocolate mousse, enrobed in dark chocolate, with a chocolate sauce and chocolate curls. Warm apple fritters, cinnamon sugar, creme Anglais, French vanilla ice cream. 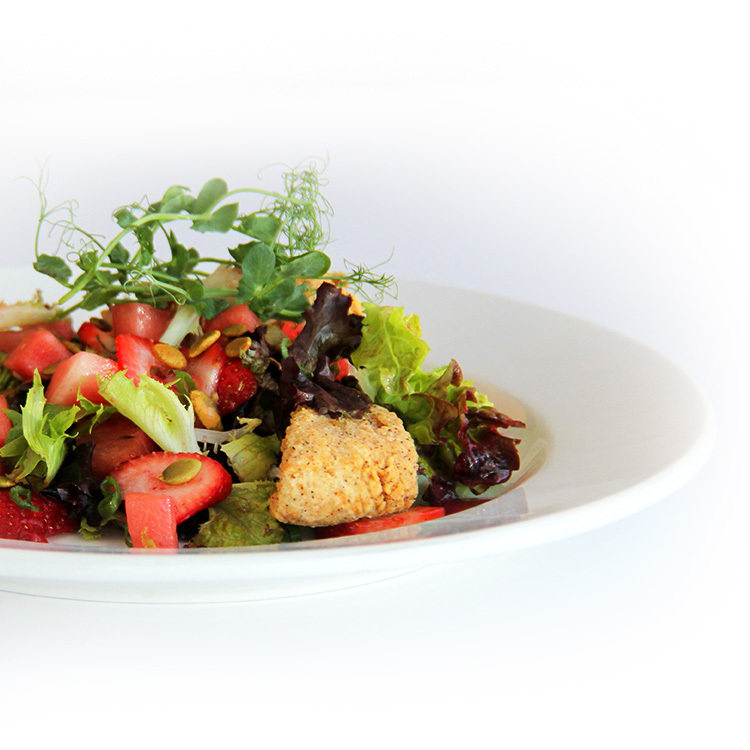 A mixture of seasonal fruits and berries, local organic honey, wild mint. Gluten Free, Mi'kmaq Inspired. Served with tomato sauce or buttered noodles. Serving of protein, mashed potatoes and soft cooked vegetables. All meals come with a glass of pop, juice or milk and a sundae of your choice (chocolate, strawberry or caramel).